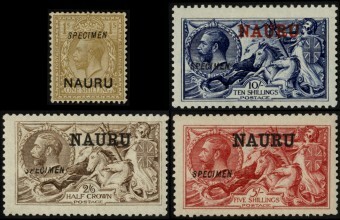 1901 Marshall Islands 'Yacht' set of 13 as used in Nauru until 6 November 1914. 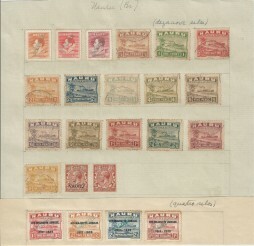 Most unusually sent to the UPU for distribution to other members in normal unused condition (normal UPU distribution is of stamps overprinted 'Specimen'). 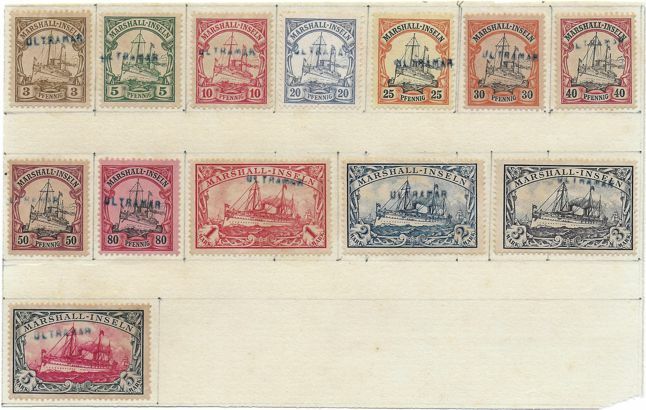 In this instance the stamps were sent to the Portuguese Post Office in Lisbon where they were handstamped ULTRAMAR in blue before being forwarded to the Portuguese Colonies. Affixed to part of a page from the Goa Post Office archives. Michel 13-25SP var (normal specimens cat €1300).